This has been the most awesome summer ever, the Crone of Lake Cowichan’s grand daughter Layla gushed to herself as she strolled along narrow Youbou Rd. First, getting to spend time here with my granny and learning about all this psychic stuff then my parents getting back together again and in two weeks, my sixteenth birthday and my learners drivers license. The only thing that could top all that would be a boyfriend. Sighing to herself as only an almost sixteen year old girl can, what boy would want to date a freak like me. All the guys at my school think I’ll turn then into frogs, although, if I could, some of them deserve to be. At least the thought made her smile, still, come September, she’d have to deal with all those jerks again when she returned back to high school. Maybe we’ll move. It could happen, if dad wants us to live somewhere else as a family. Kicking a pinecone on the side of the road in defeat. “Yeah right, fat chance of that happening. Like I could be that lucky”, she huffed out loud. Layla came out of her pout and looked around to get her bearings and locate the direction of the puss trying to get her attention. 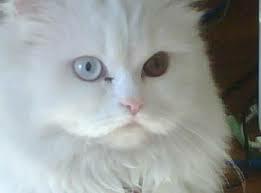 Perched on the cross rail of a white picket fence sat a beautiful white Persian cat with one blue eye and one green eye. The cat purred as it leaned into Layla’s hand for a pet. “Do you live here Kitty?”, she asked then reached for the gold coloured tag hanging from it’s purple nylon collar. Engraved was the name “Celo”. “Well it’s nice to meet you Celo,” she offered then continued to stroke the cats silky white fur from head to tail. Startled by the statement, Layla looked up and saw a frail, elderly lady dressed in a mauve velour track suit, white Velcro runners with snow white hair pulled back into a bun at the base of her neck and silver wire rimmed glasses leaning on a cane at the top of the step to the house within the white picket fenced yard. Who wears velour in August thought the teenager? “I said, are trying to steal my cat young lady?”, the lady repeated sharply when Layla was slow to answer. “No ma’am, I was just giving her a pet”, Layla finally answered. As Layla walked past the old bag and her cat to leave, she felt a dark energy shudder through her and snap her nerve endings with a zap that shocked her into a run and a sudden need to get as far away from the situation as possible. When she finally stopped running several blocks later, it wasn’t fatigue she felt from the exertion but a adrenaline spike from fear. Layla needed to get home, back to her grandma. She felt frightened, scared, weak, weird, like someone slipped her a drug or something. What had just happened? Jack came by soon after Corrie, the Crone of Lake Cowichan, finished her ominous reading and Two Toes the Raven had visited. She was still in contemplation when he strolled up on the deck. “Oh good, tea. I could use a cup of that myself. Is there more inside?” Without waiting for an answer because he was sure there would be, Corrie’s neighbour walked into the kitchen to help himself. “Are these cookies for anybody?”, he called out. Corrie was a few beats behind as she brought herself back to the present and finally acknowledged Jack’s presence but by then he was back outside on the deck with a mug of tea and a plate of cookies. Between bites of sugar cookie and a slurp of tea, Jack nonchalantly inquired about what she needed to contemplate on. The friends were laughing when the front door slammed shut and Corrie’s grand-daughter and apprentice blew through the house to the French doors onto the deck. “An old lady attacked you! How? Are you okay? Are you hurt?”, Corrie stood up to have a closer look at Layla. Shock washed over her as she tried to process what her grand daughter had just said. Jack was visibly concerned as well. “No grandma, she didn’t physically attack me! She psychically attacked me!